How do I know if I need to use flexible metal? Knowing when to use flexible metal products can be tricky. Let us help guide you through the decision making process. There are many different types of hoses and expansion joints available on the market, including metal, rubber, composite, PTFE, and fabric. The decision of which hose type to select depends on the application for which the hose is being used. TEMPERATURE EXTREMES. If either the temperature of the media going through the hose or the surrounding atmospheric temperature is very cold or hot, metal may be the only material that can withstand such temperature extremes. CHEMICAL COMPATIBILITY. Metal hose can handle a wider variety of chemicals than most other hose types. If the hose will be exposed to aggressive chemicals (either internally or externally}, metal hose should be considered. Here is a great resource to check chemical compatibility. PERMEATION CONCERNS. Non-metal hose is susceptible to gas permeation through the hose wall and into the atmosphere. Metal hose, on the other hand, does not allow permeation. If containing the gases inside the hose is important, metal hose may be required. POTENTIAL FOR CATASTROPHIC FAILURE. When a metal hose fails, it usually develops small holes or cracks. Other hose types tend to develop larger cracks or come apart completely. If a sudden hose failure is potentially catastrophic, a metal hose may help minimize the effects of a failure by leaking product at a slower rate. ABRASION AND OVERBENDING CONCERNS. To prevent abrasion and over-bending, a metal hose can be used as a protective cover over wires or even other hoses. FIRE SAFETY. Other hose types will melt when exposed to fire, while metal hose maintains its integrity up to 1300° F. (See NAHAD derating chart). ACHIEVING FULL VACUUM. 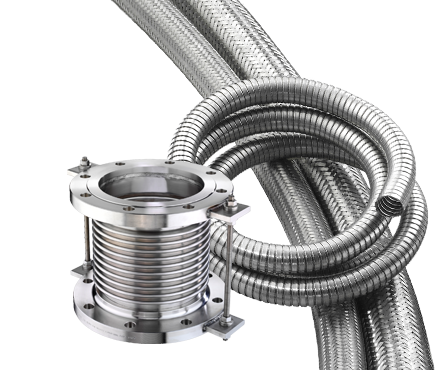 Under full vacuum, metal hose maintains its shape while other hose types may collapse. FLEXIBILITY IN FITTING CONFIGURATION. 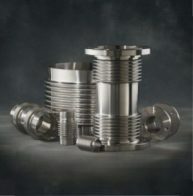 Virtually any type of fitting can be attached to metal hose, while other hose types require special shanks and collars. I need to use flexible metal. What’s next? Here are some guidelines for selecting the right hose for your application. And our Inside Sales team is always ready to help you in product selection and optimization. Contact us or call us at 800-221-2319. We’re happy to help.